Home Money & Deals	The New iPhone is Out… Get Cash For Your Old One! How gorgeous is the new rose gold iPhone? As luck would have it, my contract runs out just before the release date. I was so excited to finally be upgrading my iPhone (I feel like the last one on earth with my much older version) that I pre-ordered a pink (er, rose gold) and then looked at the upgraded features. It was confusing how to buy one with just a renewed contract instead of the new lease/payment plan since it really makes more sense for someone like me who keeps their phone for more than a few years, and I love how selling my old phone offsets the cost of the new one with the contract extension almost completely (once I even came out ahead!). If you’re having trouble with it as well, order from your carrier instead of Apple. Not all carriers are still offering the subsidized phones these days, but AT&T still is. 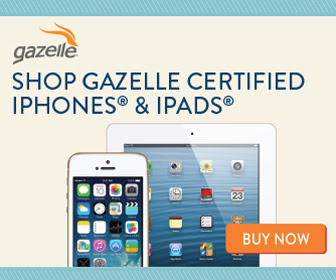 But first, head over to Gazelle to lock-in your buy-back price. It will beat Apple, Best Buy, & AT&T’s buy back prices and you can complete the entire process from home. You can secure your buy-back price now and send your phone in later after your new one arrives. Price and Affordability – Pre-owned devices typically cost less than their brand new counterparts of the same make and model. At a time when brand new smartphones often cost more than $500 or even close to $1,000, a gently-used smartphone can save you up to 50 percent or more off original pricing. Test-Drive Advantage – Instead of buying an expensive, brand-new smartphone that you might end up disliking soon afterward, you could purchase a used or refurbished device with a similar brand or operating system to the new phone that interests you. This way, you’ll get to test-drive that type of phone before making a significant investment in the new device of your choice. Better for the Environment – When you buy a gently-used device, you’re engaging in a form of recycling. Old gadgets and devices are otherwise disposed of, contributing to pollution. New phones require manufacturers to deplete more of the earth’s raw materials. By buying a pre-owned device, you’re investing in sustainability and a cleaner environment. Low Risk, High Reward – Many people want a practical phone that they don’t have to worry about how to use or what the consequences will be if it gets exposed to wear and tear. Unfortunately, most carriers don’t offer the type of entry-level smartphones that appeal to cost-conscious consumers. The solution is to purchase a certified pre-owned device that will be serviceable and functional without the cost and risk. Great for Labor-Intensive Jobs – For most people in labor-intensive fields, getting a gently-used smartphone is a no-brainer. Professionals who regularly perform factory work or operate heavy machinery don’t typically want to sink a lot of money into a fancy, expensive new phone that will be at risk on the jobsite. But even workers who hold office jobs may not want a top-dollar phone model in their pocket or purse all day. Less Worry if Lost, Stolen, or Broken – Twenty-five percent of Gazelle’s customers cite a lost, stolen or broken device as the main reason for replacing their phone, making buying a certified pre-owned model not only a practical solution, but also a cost-efficient one. Smart Choice for Kids – Today, most kids — even those in elementary school — have some kind of smart device, whether it’s an iPad, a smartphone, etc. In fact, a National Consumers League study found that 60% of parents offered their children cell phones at ages 10 or 11, a number that continues to skew younger. However, at six, seven and eight years old, most children do not understand the responsibility of owning a new iPad or smartphone, let alone comprehend the cost of replacing it when it breaks. For parents looking to fit their child with their first cell phone or tablet, a brand new, fragile device may not be the best choice – and for good reason. A gently-used device is a no harm, no foul approach to suiting children with their favorite shiny object. Can Get Around Contractual Obligations to Carriers – One of the biggest reasons that families buy a certified pre-owned phone is to get around contractual obligations to carriers. Americans keep their phones for an average of two years, but some manufacturers are pushing for more rapid device churn. What’s more is that many carriers have limited their smartphone offerings, only selling the newest models from particular manufacturers. So if someone’s phone is damaged before their free or discounted upgrade is available, they’re faced with buying a new phone from the carrier at high cost. By purchasing a certified pre-owned phone, consumers get a high-quality phone without having to deal with contracts or strings attached. Carefully Inspected for Quality – A certified pre-owned device is one that has been strictly inspected for any problems or issues that may have developed since the phone was originally shipped from the factory. Highly-trained inspectors look for all sorts of hardware and software issues, aiming to ensure the phone is as functional as when it was originally sold by the manufacturer.